Amazon has unveiled a new Kindle lineup every September for the last two years and it shouldn’t come as a huge surprise that Amazon has decided to drop prices of Kindle Fire HD tablets by $40. Chances are they’re just trying to clear out inventory before it rolls out an updated model. Be it Apple or Amazon, once the rumors of a new or upgraded version start to hit the newsstands, buyers tend to delay the decision to buy because they want to get the latest product. Companies counter this by offering huge discount on current or outdated models to clear out the inventory. With cut throat competition, it makes sense to buy an older version of the product and save money in return. 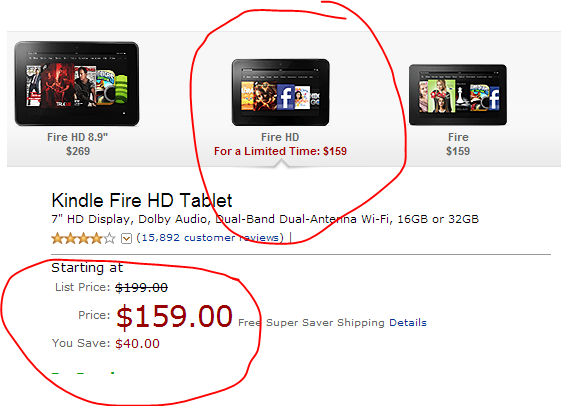 Amazon is trying to fuel that by discounting Kindle Fire HD and selling it for $160 instead of regular price $200. The next version of Kindle is likely to be faster. If you use your Kindle to watch a lot of videos and play a lot of games – it may be worth to wait for the next line up of Kindle devices, which are likely to be should be mid October or November. However, if you used your Kindle devices for a lot more activities like reading books, apps etc – this is a deal you should not let go. Get Kindle Fire HD for $40 off at Amazon. Read Kindle Fire HD review.